The code demonstrates how the Qt application can communicate with the embedded ActiveX controls using signals, slots and the dynamicCall() function. The MainWindow class declares a QMainWindow based user interface, using the Ui::MainWindow class generated by Qt Designer. A number of slots are implemented to handle events from the various user interface elements, including the WebBrowser object, which is a QAxWidget hosting the Microsoft Web Browser control. The constructor initializes the user interface, installs a progress bar on the status bar, and loads the bookmarks. // This is called multiple times after NavigateComplete(). // Add new URLs to history here. const QString historyAddress = historyActions.isEmpty() ? Different slots handle the signals emitted by the WebBrowser object. Connections that don't require any coding, i.e. connecting the back action to the GoBack() slot, have already been made in Qt Designer. tr("This Example has been created using the ActiveQt integration into Qt Designer.\n"
"It demonstrates the use of QAxWidget to embed the Internet Explorer ActiveX\n"
const QString url = arguments.size() > 1 ? The rest of the implementation is not related to ActiveQt - the actions are handled by different slots, and the entry point function starts the application using standard Qt APIs. To build the example you must first build the QAxContainer library. 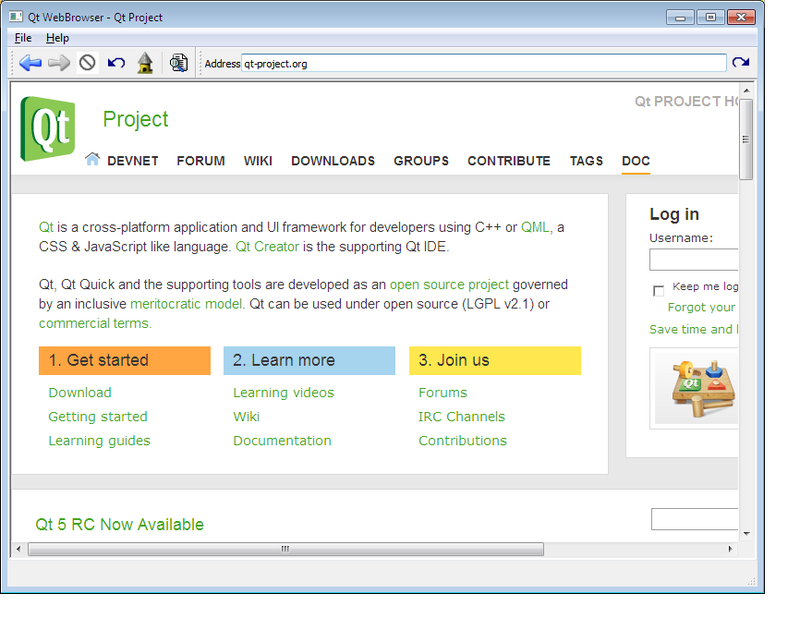 Then run your make tool in examples/activeqt/webbrowser and run the resulting webbrowser.exe.